Yoeke Nagel is a journalist and author from The Netherlands. 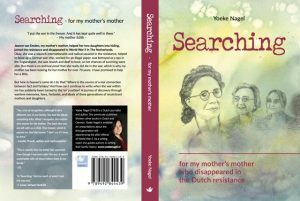 In this book Yoeke tells the story, quilted together over decades of research, of her Grandmother Jeanne van Emden, a member of the Dutch Resistance during WWII. This is the story of Yoeke’s family who were persecuted by Nazis; of a courageous woman, and her children, who lived, and about some who didn’t come back from the camps. Searching is an engaging read, a collection of memories and information woven together into one story. The writing is really good, as is the English translation (the book was written in Dutch). Searching is also a powerful message for all people now, as we see fascism rising, leaders who are similar to those that drove the fascism of the early 20th century, and the need for courage and resistance. Music by: De Dijk, Édith Piaf, Johnny Clegg & Savuka, Christine Ebersol, Joe Jackson, and Sarah McLachlan.